When a body is discovered laying in the snow in the Engadine Valley, Hardy Durkin becomes embroiled in the hunt for a murderer. There's a lot going on in this book; a body in the snow, a bombing at the ski-marathon, a terrorist arms deal, an incestuous relationship, poisoning, armed drones firing bullets etc and it's all happening on the ski slopes in Switzerland! 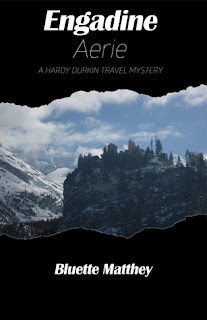 Hardy Durkin is a likeable character who, completely by chance, finds himself in the thick of things and agrees to assist the authorities in capturing the culprit(s). Engadine Aerie is written in a lighthearted fashion so there's nothing too gory or upsetting. It reminded me of the Agatha Christie-style detective novels I read as a teenager where the characters all seem rather jolly and shouldn't be taken too seriously. The setting of the book was inventive and I loved imagining the ski slopes, the celebrities holidaying there, the après-ski entertainment and the glamour. on balance, I thought it was a good read and I'd be interested in discovering what Hardy gets mixed up in next. My thanks to author Bluette Matthey for providing a copy of this book. Hardy Durkin heads to the pristine Engadine Valley in Switzerland with the Skimarathon in mind, but is detoured by a body in the snow and an exotic beauty. While assisting TIGRIS in the hunt for a terrorist arms buyer he narrowly escapes two attempts on his life and meets a new and very deadly nemesis in Engadine Aerie.